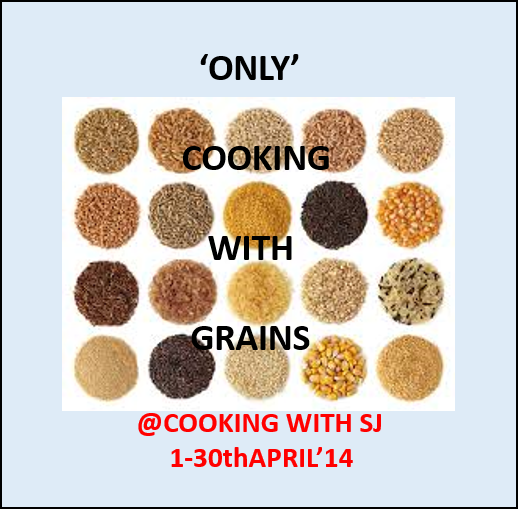 SJ's Food Court is now "www.cookingwithsj.com" :): Event with a Giveaway: "Only Cooking with Grains"
Event with a Giveaway: "Only Cooking with Grains"
Do you believe in eating healthy food? If yes, then you must be knowing that grains being important sources of fiber, vitamins, minerals… you must include them in your daily diet! Well… true that some grains are healthier than others, but overall each one of them provides many nutrients which are essential for health. Whole grains like barley, buckwheat, corn, quinoa, rye etc. Refined grains get processed in a mill to remove the bran and germ from whole grains… Sad :( as the process also removes some amount of fiber, iron, and vitamins too!!! In any case, we’re using those refined grains which are widely accepted in form of flours also. So, pick your grain, cook a dish and link up here!!! Even though I’m a regular reader of Pari’s Space, I never had been a part of this ‘Only’ series! And so I wanted to grab a chance on the announcement itself… I had been waiting for my turn, and here I’m with you as a host of Pari’s Event of the month – “Only Cooking with Grains” :) Ahan… I’m definitely the one who strongly believe in staying healthy, enjoying deep-fried munchies or junk food at times is considerable though… But on a serious note, I love trying out different grains and different cuisines at the same time. Visit this link and start linking your entries from today itself!! !